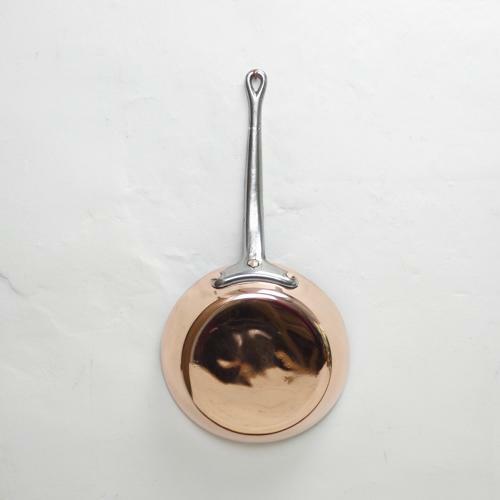 A small, French copper frying pan. This piece is made from a substantial gauge of copper and it dates from c.1920. There is a brased repair near to the end of the steel handle. Either this was done in the manufacture or someone has loved their frying pan enough to have this repair done. The pan measure 21.6cm. diameter by 6cm. deep and the overall length, including the handle is 43.3cm. The pan is in excellent condition. We have not had the piece re-tinned but the tinning is still in very good, usable condition.